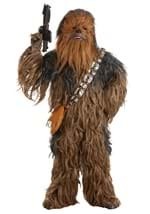 Turn into Han Solo's sidekick and co-pilot of the Millenium Falcon with our Deluxe Chewbacca Child Costume. Included is a deluxe jumpsuit covered in soft fur, a latex mask, matching gloves, a pouch, and over-the-shoulder bandolier. The high quality Chewbacca mask has eye, mouth, and ear holes for unrestricted vision and hearing. 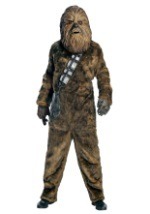 Get the authentic look of Chewbacca with this deluxe kid's Star Wars costume and add our Chewbacca hands for a detailed costume!